I have previously spoken on the subject of poor customer service in another blog article regarding service at a local fast food franchise. But that was mild compared to the ongoing saga of my recent adventures with Time-Warner cable. 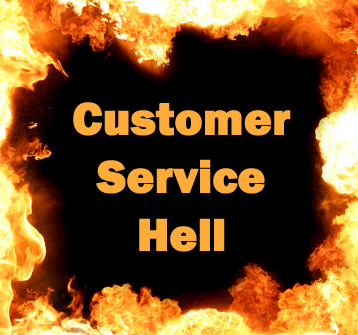 I am here to warn you if you may be entering into the Realm of the customer service world of Time-Warner. As Dante said in Inferno, “Abandon all hope, ye who enter here”. This applies to customer service hell, as well. The following is my recollection, as best I can, of my recent experience with Time-Warner. I am probably leaving some parts out because during the moments of my insanity brought on by the interaction with customer service, there is periods of missing memory. Recently I was enticed by the idea of having a 50mb internet connection to my home. Having lived with a DSL line that averages 8.6mb, this speed enhancement was very alluring. So, against my better judgment, a phone call was made to Time-Warner to order both high-speed internet and voice over IP telephone service. The salesperson was most helpful and promised me that I would have an installer at my location in two days to run a cable to my house, and that my equipment would be dropped shipped in three days. He also indicated a price that was very competitive with my current provider for phone and internet services. I am not positive, but I think he may have also promised me the moon and the stars as part of the deal. I was lured by his siren song and accepted the deal. That was the high point of the interaction with Time-Warner. Two days later, when the promised installation of my cable line was to take place, it did not happen. Three days later, when the equipment was to arrive, it did not happen. At this point I started to have some misgivings. A phone call was placed to Time-Warner and the customer service representative was having a difficult time in understanding how it is possible that I did not have a cable connecting my house to their pole. She also was flabbergasted by the idea that I did not ever have cable service at my house. It was obvious to me that we lived in an alternate universe to one another. After a lengthy conversation, a new deal was struck, a new installation date was determined, and a new deliver date was scheduled. The customer service representative was informed in no uncertain terms that should these dates or commitments not be honored, my intention was to call back and cancel the entire deal. At some point, I am not totally clear on the chain of events, an installer in a bucket truck showed up across the street from my house. He got out, looked up at the pole, scratched his head a few times, got back in his truck, drove away and was never seen again. It was later reported to me that the record indicated that he had a conversation with the customer, advised them of a problem, and that an alternate solution would be found. Hmmm, he did not talk to me nor my wife, and no one else lives here. Perhaps the dog barking at him through the fence counts as a conversation with the customer. The promised equipment was delivered, but there was still no cable attached to my house so it was not very useful. The day of installation came, but no installer came. So, as promised, I called them back and canceled my order. Of interest, several days prior, I actually received my first bill in the mail. It was for the agreed upon amount, but did not include the voice over IP telephone service. I simply ignored the bill since I had canceled the service but was surprised to receive a second bill a month later. I called, explained, and was promised everything would be taken care of. Next month, I received another bill. I called, explained, and was promised everything would be taken care of. Then to my utter astonishment, I received a collection phone call at home threatening to cancel my service if I did not pay my bill. I explained and was promised that everything would be taken care of. By this point I was close to having a “Falling Down” episode. The next month, you guessed it, I received a bill in the mail. Although the bill had been reduced to about $8.00, I was still receiving a bill for a service that I did not have and a cable that was not attached. I cannot help but wonder what would have happened should they tried to make good on their threat and cut my service off. In their world they would probably need to install a cable, implement the service, and then turn it off. I am sure the saga will continue. I am sure I will get another bill, and I am sure I will have to call and speak to a customer service representative, slowly, using words of one or two syllables. I should mention that the call center is not overseas, and I am not speaking to a customer service representative who has a limited command of the English language. No, I am calling a call center in Cleveland, Ohio, speaking to an American customer service representative, who has a limited command of the English language. Maybe India would have been better. Then, at least, they would have had an excuse. That is my story. I provide this to you as a public service. Please keep this in mind when you are lured by the siren song of high-speed internet. If you value your sanity, don’t. I have yet to have a good customer service experience with any telcom or cable provider. I have a similar story related to us leaving Comcast, switching to Verizon and then switching back to Comcast. Tom- the call from the collection people put a ding on your credit report. That is grounds for a lawsuit. Do you have a friend in the legal area?? If so, I’d ask him to write a letter to home office of the company and explain what is going on. Demand ir be totally fixed and the credit bureaus notified to erase that blot I’d also register a complaint with the BBB. You should also refister a complaint with the Ohio attorney general’s office. I feel for you. These guys ran a line from the street, and hooked into the corroded tap. Reat assured, though… I was assured at 9:30 this morning that I am the next stop so they can install the tap that they assured me would be installed today. It’s 2:00… But I am assured. I use Comcast. But, based on my business, I had a commercial account and have kept it. The service is actually really good. But, I have called Comcast on behalf of a residential customer, and it was like I was talking to an entirely different company. I am sure I could save some money if I switched to a residential line, but I need my service to support my working from home. I can’t take the risk. Tom, remember the day that FedEx delivered my DSL modem to work before anyone was there and it turned into a bomb scare, resulting in the Fire Department using its distilled water cannon on it to destroy it? Good times (not!). Cincinnati Bell told me to take the destroyed unit to one of their cell stores, and had a new modem at my house by 10 a.m. the next day. See ya! I also recall a certain individual (not you) who shall remain nameless, running around bragging how he had discovered the potential threat. The part he left out is that he “discovered” the potential threat after I came in, reported it to him, and took him to the location. Glad to see you are still reading the blog.